I can’t believe we are planning our December goals already! This year has been a great one; we got out of debt, started building savings and planning for the future. I had felt that previously, the last few years of my life have put me on a path that didn’t feel right; debt meant less choices and doing things we didn’t want to do. Fixing our finances has helped us to move forward and really look forward to the future. 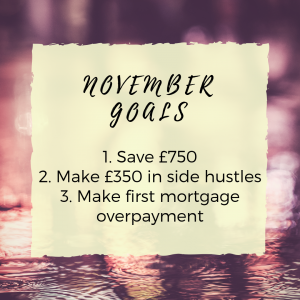 Firstly, last month we aimed to save £750, which was a combination of £400 from our salaries and £350 from side hustles- ambitious, right? It definitely was! We ended the month having saved £600- £150 short of target. £400 was saved from our salaries but I only side hustled £200- I say ‘only’ but I’m actually rather pleased with this! Unfortunately though, the majority of our savings have went towards our holiday at the end of the month, which was planned, but it means BS3 is still a distant dream for now. So in falling short of my side hustle target, what did I learn? Well, I forgot to factor in the weekend activities that I’d committed to, and the fact that we were on holiday during the last week of the month. Most Saturdays, I was tied into pre-arranged commitments and Saturday is prime time for matched betting because it’s where the majority of profits are made, so I struggled to keep up with my goal. So when it comes to goals, you either succeed or you learn, and this month I learned that I need to plan out my month in advance before committing to a side hustle target figure. As for our mortgage payment, we finally started the process for overpaying. You can read more about this here, and check out how much you can save by overpaying (spoiler alert: you will be shocked! Pleasantly, of course). Yet another ambitious plan but shoot for the stars, and all that! Last month, Mr M and I decided that the £500 for Christmas that we planned to cover from our salaries was better off in savings- BS3, I’m coming for you! 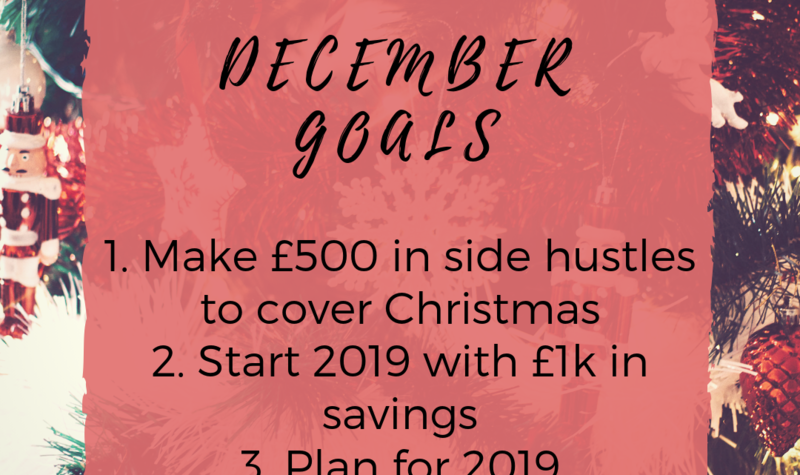 During December, Mr M side hustles anyway, and with earnings from a few difference sources, we are aiming to hit £500 in side hustles to cover Christmas completely. If you were thinking of relying on credit cards to cover some of your Christmas expenses, then why not join us? Give yourself the gift of starting the new year as you mean to go on with a profitable side hustle! We became debt free in July 2018 but we have struggled since then to build any real savings, particularly since both of us reduced our working hours and we took a few months off the financial grind. We had a holiday booked for the end of November (priorities! ), a wedding to pay for in April 2019, and lots of other little expenses we deferred whilst paying off debt, so since we joined the debt free club, we have just been ticking over financially. But this month, we are hoping to get our sh*t together finally and get BS3 on the road. With Christmas paid for with side hustles, I’m hoping to save a good chunk of our salaries and hit our target. Gotta start the new year off right! 2019 is going to be lit! I have so many plans for the year, particularly before I get married. I want to publish my first book, finish BS3, and start earning a passive income. So in December, I’ll be working on a plan for where I want to be, by when, and how I’m going to get there. By the end of the month, I’ll have my full plan together. I’ve learned during our debt pay-off that for goal planning to be effective, your goals have to be SMART (Specific, Measurable, Achievable, Realistic and Time Constrained). I know I probably sound like Sally Sensible but the SMART system really works. For example, let’s say you occasionally think to yourself, ‘If only I had more money coming in every month, I’d be able to manage/get out of debt/have a better life/have more choices/etc.’ This is the basis of your goal, but without doing anything more than thinking those words, it won’t happen. You need to take those words, build a plan, and get that extra £300 per month. Specific/Realistic- How much do you need to get to be where you need to be? Obviously if we were all millionaires, that would be ideal, but thinking realistically, what is the minimum figure that you could earn that can make a real difference to your situation? Let’s say £300 per month is that figure, based on your budget. £300 would allow you to overpay debts, book a holiday, or just get on top of your bills. So now you know how much you need, start thinking of ways to get there. Matched betting is a great start, but if it’s not for you, selling, reselling, overtime, a part time job, freelancing, mystery shopping or money making apps are so many good places to start. Measurable/Time Constrained- Once you have a specific figure in your head for how much extra you need to earn, you need to figure out how long it will take you to achieve your goal, based on some research into how long it takes to get there, plus how much time you can commit. Can you make £300 this month and consistently hit this, starting now? Or do you need time to build yourself up to your goal? With matched betting for example, a lot of people are interesting in starting but don’t start by put in the time to understanding the process, which might take a few hours to master. Understandably, we all lead busy lives but plotting a few hour into your weekend could be the basis of you making several thousands of pounds over the coming months, so it’s well worth the time investment. So while you might not be able to start this minute making £300 per month, can you dedicate two hours this weekend to completing the Profit Accumulator free trial? 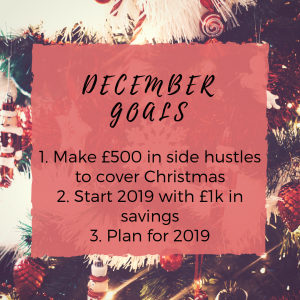 Achievable- So now that you know that your goal is to make £300 per month, and with your plan for how to do so, you are aiming to start in December and think that January will be the first month you meet your target, you can assess if this is achievable and make adjustments if necessary. Don’t forget to factor in time to wind down, relax and chill because health is wealth, after all. The thing about goal planning is that it’s not something for the super motivated, it just comes down to good planning. Give yourself a good plan, and anything is possible. Well that’s my December goals 🙂 Comment below and tell me yours, or just let me know how 2018 has been for you. Have you had a successful year, or will next year be the year you smash it?